Residential treatment is extremely beneficial for substance and addiction treatment. There are many benefits and challenges to being away from loved ones while getting treatment for your addiction. Inpatient treatment ranges in length of stay depending on the severity of the addiction. This type of treatment can give you the ability to be away from enabling situations, people, and stay substance-free . Days are typically structured to promote recovery and healing, and it can have an enormous impact on recovery outside of the residential setting. Detoxification, which usually occurs first in the inpatient setting, is a benefit because it can provide the person with a safe and supervised way to detox. It involves medically supervised withdrawal, often with medication assistance, and direct care staff to help manage symptoms of withdrawing from substances. Being in an inpatient setting can also be beneficial because there is 24-hour supervision and care for you as you detox and begin treatment for your addiction. With underlying issues such as depression, bipolar disorder, and anxiety, it can be helpful to have direct care staff available outside of treatment team working hours to offer support and help when needed. In 2102, almost 4% of adults over the age of 18 had co-occurring mental illness, and substance use disorders and 1% of those over 18 had co-occurring serious mental health use disorder with addictions . Also in 2012, 2.6 million adults had major depression with thoughts of suicide and substance abuse addictions. These statistics state the importance and benefit of residential care during recovery from addiction. Additional benefits include being away from triggering situations, or negative influences . Patients get the benefit of constant support that others in intensive outpatient or direct outpatient care do not. Residential treatment also offers protection for loved ones from your addiction and behaviors. It allows time for your family to gain support from a treatment team and education on your addiction from the residential facility. Residential treatment can also offer support from other members who are in similar situations and pasts. It can create a sense of camaraderie and develop supportive friendships. Other benefits of residential treatment for addiction is the use of various therapies at one location, nutritional support and planning for in and outside of treatment, family education and therapy groups, and learning basic self-care skills in a supportive environment. One challenge to being away at treatment is being away from loved ones. It is hard to feel isolated from them as well as lacking support. Being able to write letters to them, send emails, face-time, or talk by phone can help you stay connected during your treatment. Another challenge to treatment is the financial strain it can bring. Treatment is costly, and if insurance does not cover 100%, there will be out-of-pocket costs for your family. It can be a challenge to cope with the expenses and burden this can bring. Working with your insurance to come up with a payment plan, and look at ways you can reduce monthly spending to be able to ease the costs. A further difficulty with residential treatment is reintegrating into your old life during addiction. It can be challenging to discharge from residential treatment and go back to your family routines, expectations, work responsibilities, and managing life after residential treatment. Working on how to plan and prepare for this while in treatment can aid you in knowing what to expect and where potential triggers for use may be. Continuing treatment after residential can be a key to continued sobriety. Stepping down into Intensive Outpatient Care can help with still having several hours of treatment and support while practicing tools in your everyday life. Being able to continue with your treatment team sessions, group therapy, and family therapy is essential to maintaining sobriety. Some individuals may feel that moving physical locations or changing jobs can help with toxic environments and keeping sobriety a priority. Talking this through with your family and treatment team can help you decide if this is the best decision for your aftercare treatment. 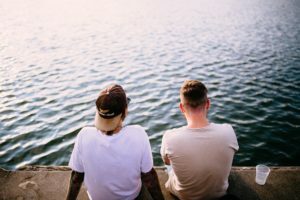 Attending 12-step or aftercare treatment can assist you to foster friendships and receive support from other individuals who have gone through similar treatment, past situations, and current recovery focus. It can help to gain the support of a sponsor and have weekly check-ins with the group to stay on track or attack triggering situations. Being in residential treatment can be an important step in your recovery from your addiction. Being able to know that there are pros and cons to this change is part of being able to prepare for new challenges and success. Talk with your family about expectations they have for your recovery as well as stating your own. Let your loved ones know that you will miss them and that you love them is important. Focus on the reasons why treatment is important to you and what you will be gaining in the process. Remember that residential treatment is challenging and pushes you to uncomfortable places, but in the end, being addiction free is worth the pain of sobriety. About the Author: Libby Lyons is a Licensed Clinical Social Worker and Certified Eating Disorder Specialist (CEDS). Libby has been practicing in the field of eating disorders, addictions, depression, anxiety, and other comorbid issues in various agencies. Libby has previously worked as a contractor for the United States Air Force Domestic Violence Program, Saint Louis University Student Health and Counseling, Saint Louis Behavioral Medicine Institute Eating Disorders Program, and has been in Private Practice.